For further information, please email us. Participate in one of our studies! We are looking for children (7-12 years) and adults to participate in our studies. We are interested in normal subjects as well as those with reading, language, or attention disorders. Our studies are approved by the MGH Institutional Review Board's Committee for the Protection of Human Subjects. All subjects will be paid for their participation. Additionally, children who complete the MR scan will receive a picture of their brain to take home. If you are interested in participating in our studies, please fill out the appropriate form. Click here for the adult form and here for the child form. We are looking for children 7-12 years of age who have reading disabilities with or without ADHD. Our aim is to identify differences in brain activity that would differentiate between these groups so that better diagnoses and interventions may be developed. Each child will be administered a series of standardized tests on language and reading. Scores on the assessment will be available to the parents. The study will also include harmless, noninvasive brain imaging (EEG, MEG, and MRI) during which the children will listen to speech or read words. Qualifying children will have normal hearing and speak English as their primary language. Children will be reimbursed for their participation. Testing will be done at Massachusetts General Hospital's NMR Center and all information will be held confidential. For more information, please contact Maria at maria@nmr.mgh.harvard.edu. 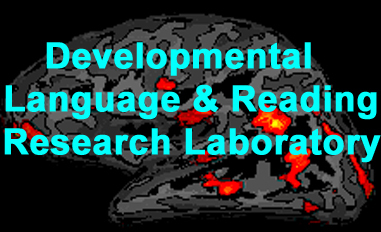 We are looking for both adults and kids for language and reading studies. We have a number of behavioral, MEG/EEG, and MRI studies running at any given time. For more information about becoming a subject in one of our studies, please contact Maria at maria@nmr.mgh.harvard.edu.